Choose a component to view, download or share. Choisissez un composant pour afficher, télécharger ou partager. Download the full advocacy portfolio, a toolkit to design, implement, and capture the results of a focused advocacy strategy. Téléchargez le portefeuille de plaidoyer complet, une trousse à outils pour concevoir, mettre en œuvre et saisir les résultats d'une stratégie de plaidoyer ciblée. Introduces Advance Family Planning (AFP) and the AFP Advocacy Portfolio. Présente Advance Family Planning (AFP) et le portefeuille de plaidoyer AFP. Features a tool to understand your context and AFP SMART: A Guide to Quick Wins, our 9-step approach to developing a focused, collaborative advocacy strategy that leads to quick wins. Dispose d'un outil pour comprendre votre contexte et AFP SMART: Guide de Quick Wins, notre approche en 9 étapes pour l'élaboration d'une stratégie de plaidoyer axée sur la collaboration qui mène à des gains rapides. Provides tools to monitor for impact and make your case to decisionmakers. Fournit des outils pour surveiller l'impact et faire votre cas aux décideurs. Presents a systematic process to document and demonstrate the results of a family planning advocacy strategy. 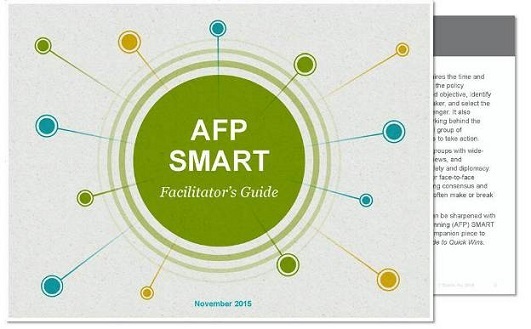 The AFP SMART Facilitator's Guide provides in-depth guidance for how to successfully facilitate the AFP SMART process. It is meant to accompany AFP SMART: A Guide to Quick Wins. Le guide de l'animateur AFP SMART fournit des conseils approfondis sur la manière de faciliter le processus AFP SMART. Il est destiné à accompagner AFP SMART: un guide pour les gains rapides. How do you identify the right moment to advance a critical policy? Or build a coalition of supporters? What is the best way to craft compelling arguments for decision makers and deliver them at the most opportune time? The execution of advocacy is frequently afflicted by false-starts or near-misses—either weighted down by too many competing interests or so generalized it is ineffectual. But it doesn’t have to be. 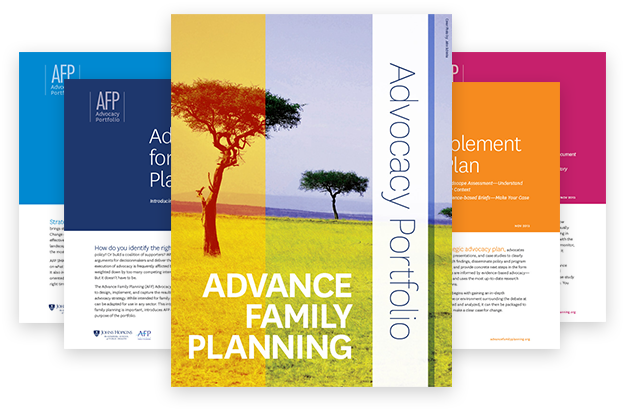 The Advance Family Planning (AFP) Advocacy Portfolio provides a compendium of our best practices and tools to refine a strategic vision, identify and motivate key players, take action, manage and overcome setbacks, and monitor and evaluate success. Whether you are a new or experienced advocate, the AFP Advocacy Portfolio can help you along the way to achieving your desired result: real, achievable, and sustainable change. Used separately, the tools can supplement an existing effort or inject new life into an initiative that has lost its vision or momentum. Used together, they provide a comprehensive roadmap to develop, implement, and evaluate a focused advocacy strategy from start to finish. This VoiceThread, presented by AFP Executive Director Beth Fredrick, walks the listener through the steps and phases of this strategic and effective advocacy approach. The presentation helps facilitators to lead groups of family planning stakeholders to reach a strategic, decisionmaker-focused advocacy strategy. Use these group exercise worksheets to "Develop a Strategy" with the AFP Advocacy Portfolio. These tools accompany the “Capture Results” component of the AFP Advocacy Portfolio. Escucha y aprende de un seminario sobre AFP SMART– una guía para obtener resultados de advocacy.